Guthrie Douglas manufacture a wide range of high quality wind resistant shading for outdoor spaces. With the ever-increasing urbanisation of areas, outdoor spaces are becoming increasingly valuable. Planning shade in outdoor spaces is crucial when converting an architectural idea in to a well-used space. Tensioned pergola and shade sail systems can operate on slim stainless steel support cables. Slim refined configurations eliminate the need for intrusive columns and bulky supporting structures. Wind resistant shade offers UV protection as well as shelter from strong winds. This ensures that a thermally and visually comfortable area is provided in all conditions. A shading mechanism is also important to ensure views are clear when sun protection is not needed. To ensure that a shading system is perfect for your outdoor space, the building design, material and solar direction are all taken into consideration. 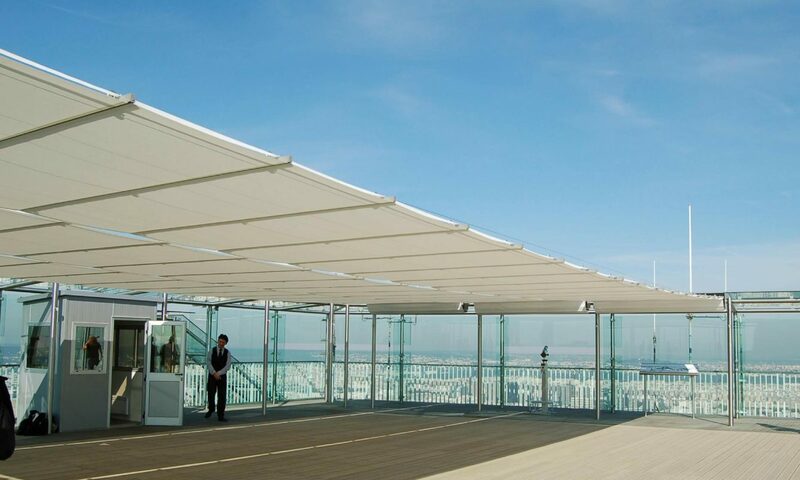 A wind resistant shade sail or pergola design can benefit from a tensioned fabric. Providing both protection and flexibility, tensioned fabric can be applied with accuracy and discretion, whatever the scale or shape. Guthrie Douglas create blind systems tailored to your individual requirements. We do so by taking you through the entire design process from conception through to installation. Our wind resistant shading for outdoor spaces can be designed for a variety of configurations with unlimited colour finishes. We also provide a wide range of fabrics and controls that are available to suit any building design. We ensure that maximum performance and a long service life is guaranteed as we are often involved in overseeing the installation of our own blinds. Our engineering expertise combined with our truly bespoke approach deliver commercial blinds that work in tune with your building design and performance. To find out more about our ranges of wind resistant shading for outdoor spaces, contact us at our head office today.